This time last year, Disney-star-turned-pop-idol Hayley Kiyoko was dubbed “lesbian Jesus” after releasing her This Side of Paradise EP in 2015, which featured a song called “Girls Like Girls.” Subsequently, she became one of the most visible out lesbian celebrities, especially among Gen Z (although we can’t gloss over Janis Ian, Brandi Carlile, Tegan and Sara, and countless others who walked so that Kiyoko could run). Fast forward a few months and King Princess (whose real name is Mikaela Straus) quietly took over as the emblematic lesbian pop star of the moment. Her sound sharply contrasts Kiyoko’s—mellow, bluesy, more instrumental rock replaces a more synth-heavy, upbeat sound. Kiyoko is, in a way, the Beyoncé to King Princess’s Beck—Kiyoko’s music is empowering and upbeat in its own right, but King Princess is a little darker, rawer, and, like Beck, she wrote and played every instrumental in her discography, as well as the vocals. The 20-year-old college dropout from New York and musical prodigy performed her show at Metro last weekend that was as magnetic as she was. Banoffee (real name Martha Brown), an L.A.–based pop artist who is originally from Melbourne, was the first of two openers for the show. Banoffee’s music is much more electronic and synth-based than King Princess’s but was just offbeat enough not to read as explicit pop. Nonetheless, she retained one of the worst stage habits of pop singers—lip-syncing rather than singing many of her songs. No amount of energetic dancing or brief interludes of live synth-playing could really bring the performance to life the way actually performing live would. This was unfortunate because Banoffee’s music seemed interesting, albeit more in an interesting-background-music, not dance-in-a-crowd, way. The second opener also lip-synced, but since the performer in question was none other than drag queen Bambi Banks, the newest member of Chicago’s Maison Couleé, this had an entirely different effect. Banks was fierce: voguing and twirling while wielding a fan in a glittery blue cape and a cotton candy pink wig. Unsurprising given the majority-female crowd, her performance to Whitney Houston’s “I’m Every Woman” gave the audience life. The song also captured what makes King Princess important to a lot of young, gay women: She represents them in a way that feels refreshingly accessible. 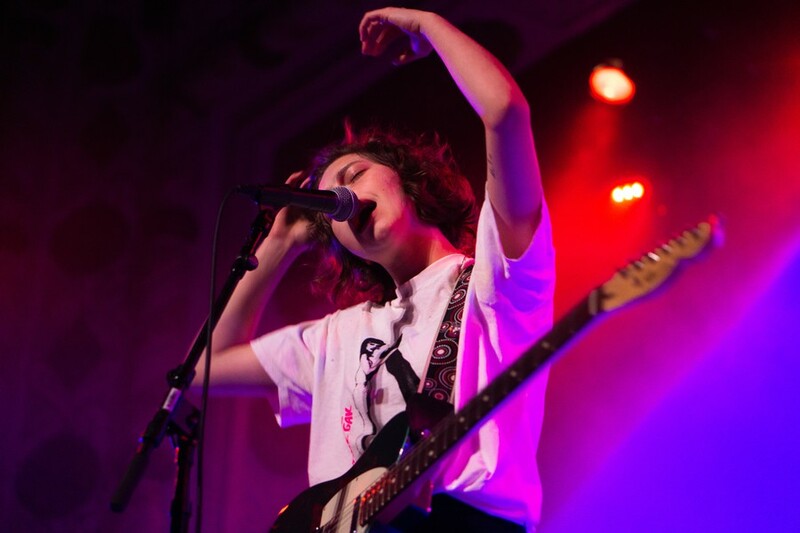 When King Princess finally took the stage, the packed room at Metro suddenly made a lot more sense. Casually tuning her guitar in a simple, androgynous outfit and a windswept crop of curls, she had the unmistakable air of a rock star. Or maybe, as she mentioned a few times throughout the night, it was that she had just smoked with her band, which is made up of friends from her year at USC’s Thornton School of Music. They could just as easily have been jamming in a garage as onstage at a show that sold out weeks after the tickets were released, exchanging jokes between songs. “Thanks for coming to listen to a sad lesbian,” King Princess deadpanned about halfway through her set. Some people laughed—after all, her earnest, bluesy alto vocals, although heart-wrenching, are far from pathetic. On the other hand, most of her lyrics, which deal with unrequited love or heartbreak, are decidedly melancholic. However, lines like “I hate it when dudes try to chase me/But I love it when you try to save me/’Cause I’m just a lady,” from her song “1950,” make it clear that her work cannot be described with a word as simple as “sad.” Echoing the quasi-psychoanalytic way that millennials address their feelings, her lyrics are self-aware in their contractions. In an interview with Genius, the artist explains that this song came from examining how her identity “sits in a room” when she moved to a new city. With just one EP and a few singles out, but a full-length album in the works, it will be exciting to watch King Princess continue to thrive.